Updated at 4:30 P.M. 1/28/2015: Brock Gibian, a Democrat running in Ward 8, and Carmen Scoles, a Democrat running in the East District, have both qualified as candidates. Their petitions were not verified until today. 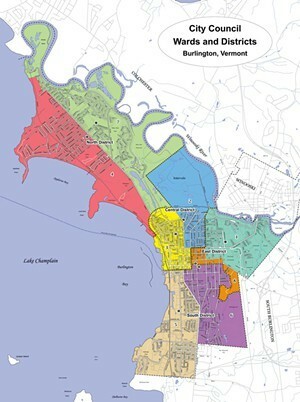 The candidate field has crystallized for what will be an unusually busy election season in Burlington. Monday marked the deadline for candidates to deliver their signatures to City Hall. As expected, there are four candidates for mayor: first-term Democratic incumbent Miro Weinberger, independent Greg Guma, Progressive Steve Goodkind and Libertarian Loyal Ploof. In recent years, half the city council's 14 seats and the school board's 14 seats came up for grabs each Town Meeting Day. But this year, thanks to a recent round of redistricting, the entire slate is open. Four current councilors — Progressives Vince Brennan and Rachel Siegel, and Democrats Norm Blais and Bianka LeGrand — decided not to run for reelection, as previously reported. Under the new system, the council and the school board will consist of 12 seats apiece. Fifteen people are running for the school board. Ten are incumbents. Stepping down are Patrick Halladay, the current chair, Ben Truman, Alan Matson and Kevin Garrison. The only candidate who hadn't previously announced was Adam Roof, who graduated from UVM in 2011 and is cofounder of the Vermont Hockey Training Center, according to his LinkedIn profile. Ben Vidal, a UVM student, had previously said he planned to run in Ward 8 but was not on the list of people who filed.